— The Wishful Swain of Devon. By POLWHELE. THE tradition of the Midnight Hunter and his headless hounds–always, in Cornwall, associated with Tregeagle–prevails everywhere. Whether this slice of mythology and folklore is the inspiration for Swindon’s fantastical Wish Hounds sculpture I’ve no idea but I’ve certainly always been intrigued by them. The Wish Hounds is a sculpture in three parts – concrete cast lettering, powder coated scrap metal and earthworks in a circle of trees. As you can see from the pictures the lettering is becoming a bit grown over in places and the floodlighting that was illuminated the hounds is now broken. Swindon’s erstwhile Thamesdown council was the first in the country to adopt a percent for art policy which encouraged developers, once their scheme was completed, to fund a piece of public art. This forward thinking and innovative scheme resulted in Swindon acquiring an unusual, if not unique, cultural landscape with public art being scattered the length and breadth of the town – amongst my personal favourites are The Great Blondinis, the West Swindon Sculpture Trail, and the lonely cow chewing the cud up at the hospital. Though really I love them all. Though some of the original ones have disappeared new ones have sprung up and even though some of them are now somewhat unloved they are no less interesting for all that. Before I started blogging about it all I’d never heard of the term ‘public art’ and really the closest I got to it was an old village pump, the Cenotaph and a redundant pit winding wheel..
“If I remember correctly, the Wish Hounds are on their long legs because they were designed to appear above the tree line for drivers on the M4 – and they used to look magnificent, leaping over the trees. However, I’m not sure whether it was because of budgetary constraints or simply forgetting that trees grow but, they were gradually hidden by the ever growing trees – which is a shame. They must have been a magnificent sight before becoming obscured by all the trees – as lovely as they are. I’m always happy to concede that there are others out there whose knowledge of Swindon is far deeper and greater than mine – ‘proper’ historians with in-depth knowledge where mine has hidden shallows. So it’s been pointed out to me today by one such luminary that what I’ve been referring to as Faringdon Park is in fact more properly called Faringdon Road Park. Which makes sense if you think about it. Apparently older Swindonians, railway men in particular, always gave it its full handle. Moreover there’s an argument for it being properly termed the ‘GWR Park’. As my source said, anything that keeps the focus on Swindon’s proud railway history has to be a good thing. And I’m not arguing with that. Last weekend I was en route, on foot, to the railway station to meet my sister off the train. It was a gorgeous sunny day and I had a bit of time to spare so decided to have a meander through the park and take a few pictures. I often walk alongside the park as I’m tramping around but rarely take the time to go through it – which is a shame as it’s a lovely big open space. The park dates from the 1840s when it was provided for the Great Western Railway workers many of whom lived in the adjoining Railway Village. It’s now popular with local residents office workers in central Swindon out for a stroll and on work breaks. As Swindon Web state: ‘Faringdon Park was also the venue for an unusual moments in 1870 when the world-renowned W.G Grace was dismissed for a duck in both innings when he played for Bedminister against the New Swindon side.’ It seems that it doesn’t matter who or what you think of there’s a Swindon connection somewhere. On Swindon Web there’s a couple of lovely old photographs. Swindon local have some on their flickr collection too. 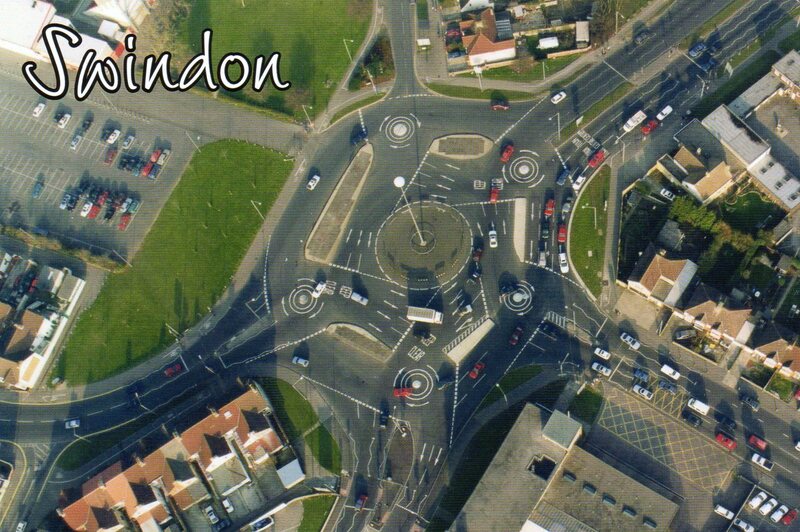 Swindon’s Magic Roundabout | Swindon Viewpoint. Wow! I just came across this fabulous piece of film made in 2008 from Swindon Viewpoint about the Magic Roundabout which I recently blogged about. I absolutely love it. The disjointed, unsettling soundtrack is very clever. And it, the roundabout that is, inspired the XTC song. ‘English Roundabout’ How cool is that? “The junction known as the Magic Roundabout, located near the County Ground football stadium, opened in September 1972. Its unusual design consists of five mini-roundabouts arranged around a sixth central, anti-clockwise roundabout. Roundabout fan Kevin Beresford said the junction was a “white knuckle ride”. Well dear readers, here we are with the last in my series of 10 things I think are worth celebrating about Swindon. As I said in No 9 it’s not by any means a definitive list, just 10 things that have made an impression on me. Any one of you out there could make a completely different and equally valid list. The point being, and as Brian so eruditely points out in his post, Swindon and Swindonians – and after 20 years here I’d like to count myself as one because Swindon is definitely home to me now – has so very, very much to be proud of. And I don’t think the ‘powers that be’ always do it the best of favours. Yes, we know it has faults but show me the town that doesn’t. I get very cross about a lot things that go on here. But picking over them wasn’t the intention of this blog – that’s easy to do, there’s other places to do it and anyway, who wants to read a blog full of rants? I just wanted to create something that minimized the negatives and emphasised the multitude of positives about this town and its people. It’s an odd thing, life. I had fully intended to round off my list with something about Swindon’s multicultural population and the Mela – I’m sure I’ve read somewhere that Swindon is an official microcosm of the whole country because any ethnic group you care to mention can be found here. However, whilst I knew that Brian was writing me a guest post I had no idea of the subject matter. I like it that way, I enjoy the surprise. I could get all Forrest Gump here, except that you do know what’s in a box of chocolates cos there’s a ‘menu’ telling you – I always thought that was a rubbish analogy. So, to drag myself back to the point, unbeknownst to me Brian wrote his piece on that very subject, hence it earns a place as No 10 in things to celebrate about Swindon. I feel there should be some sort of trumpet fanfare at this point …. instead, and without any further ado here’s a brief introduction to Brian Carter, the author of this lovely guest post which I hope you will enjoy as much as I have. ‘Brian Carter was born in Swindon in 1961. He was raised in Upper Stratton and has always lived in Stratton or Swindon. He’s traced his family tree back at least eight generations and found that a large proportion of his ancestors were born in and around the town. Dozens of them (including his father and both his grandfathers) worked for the Great Western Railway and/or British Railways in Swindon. “Swindon is an easy target for lazy comedians and miserable people who would have you believe that it’s a bland concrete jungle inhabited by soulless people – a town devoid of culture, heritage or human values. We hear such views so often that we could be forgiven if we started to believe them. But when a ‘foreigner’ from ‘up north’ creates a blog intent on extolling its virtues, we’re thankfully brought back to our senses. Born Again Swindonian doesn’t wait for the inevitable negativity and counter with a reply. Instead, it shouts its positivity and affection for Swindon from the rooftops. 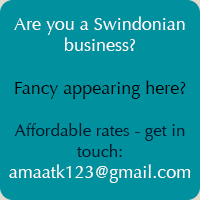 In 1997 I created SwindonWeb with the same attitude. And although I passed on the baton several years ago, I’m happy and proud to report that SwindonWeb has never broken the golden rule set down at its inception: that it would always be 100% positive about Swindon. Ironically, if Swindon has a fault, then it is that it doesn’t ‘blow its own trumpet’ often enough. For example, consider the Great Western Railway (GWR). Unless they’re blinded by their own local loyalties, most railway enthusiasts acknowledge the GWR as the jewel in the crown of Britain’s great pioneering railway heritage – the epitome of quality and style. And Swindon was, of course, the beating heart of ‘God’s Wonderful Railway’. But Swindon often seems strangely embarrassed of even that. Few other towns would be so reticent in claiming its part in such excellence. Maybe oily, smoky, noisy steam locomotives (however beautiful) just aren’t cool in these modern times. Or perhaps Swindonians are just reluctant to hark back to the past. Aside from its wonderful railway history, there are many other rich and diverse aspects to Swindon’s past – and it’s great to see that they’re now being celebrated through the hugely impressive Swindon Heritage magazine. Swindon is at last beginning to show pride in its past, but is it also concentrating on promoting its present? Well, not really. There’s still a lot of work to be done before Swindon overcomes this flaw in its character. It still needs some convincing that it really does have much to be proud of. A perfect example of something which Swindon excels at, but doesn’t give itself credit for – is its unswerving embracing of multiculturalism. It is an admirable quality, but taken for granted here. As discussed in recent editions of Swindon Heritage magazine, its positive attitude to diversity is something which Swindon has developed over the years. In the 1840s, Swindon was transformed from a small agricultural town to a large industrial one – at a rapid (almost brutal) pace. Several waves of influxes of workers from Wales, the Midlands, the north-east and elsewhere brought with them subtle religious and cultural variations. But Swindon quickly accepted those differences – adopting the attitude that they enriched, rather than diluted, the town’s character. The relocation of Londoners to our town after the Second World War met with no difficulties. And many Irish, Italian and Polish people happily settled here in the post-war years. More recently, Asian influences have added yet more colour to Swindon life. It seems entirely appropriate that Swindon has associations with not one but three twin towns. Our connection with Torun has reinforced the link with Poland, and there’s an unlikely but welcome connection with Ocotal in Nicaragua. 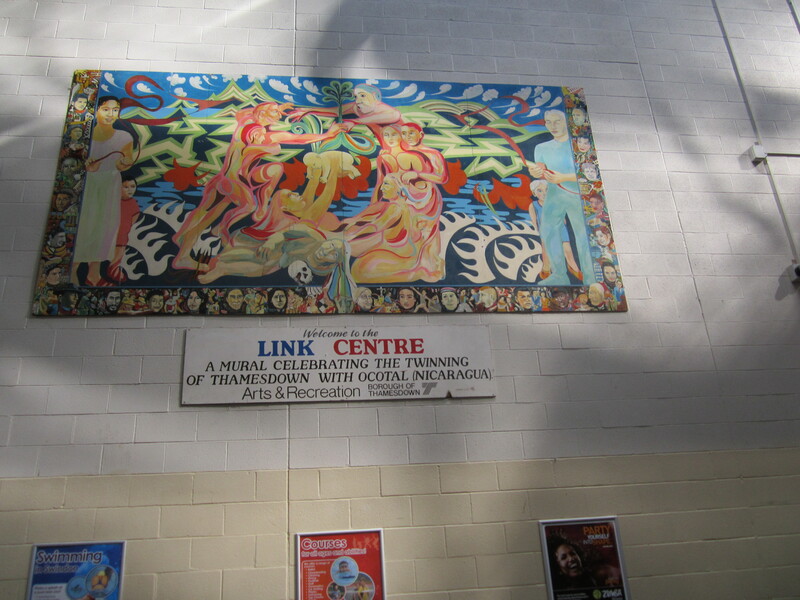 Mural in Swindon Link Centre celebrating the town’s twinning with Octotal. In the past and in the present, the human race has struggled with diversity. Evil-minded politicians concentrate on the differences between people in order to alienate, persecute and exploit them. Swindonians see things very differently, and if you wanted an example of how, you need look no further than the Swindon Mela. They have Melas in other places, of course. It’s part of the Asian character to celebrate its culture and heritage, and so other towns and cities with Asian communities have similar events to the one which took place in Swindon last weekend. But there’s something especially endearing about Swindon’s Mela: it has been so totally and enthusiastically embraced by the non-Asian people of Swindon. It’s a remarkable thing, which is worth considering for a moment. Thousands of people turn up for this annual event. They have an incredibly wide-ranging mix of cultures and beliefs, and yet there isn’t the slightest hint of racial, cultural or religious tension. Far from it. The people of Swindon (from all backgrounds) attend the Mela because they’re interested and genuinely appreciative of the differences between each other. Swindonians really do celebrate diversity. And this gives Swindon Mela a wonderful, happy, peaceful atmosphere. And yet it almost didn’t happen this year. Swindon Borough Council, mystifyingly felt the need to try to prevent it taking place. There was some ironic talk that this definitive community event had become ‘too successful’. But the people of Swindon were having none of it. Public outcry forced the Council to back-track and, thankfully, the Mela was saved. Maybe that little hiccup will prove to be a good thing in the long run – surely no one will dare mess with the Swindon Mela again! Swindon Web has a lovely report with masses of fab photos of the 2013 Mela. I’ve written before, in a previous post about the 2012 poetry bus, to refute the claim one sometimes hears that there’s no culture in Swindon. It’s absolutely not true. There is theatre and arts of all kinds in Swindon. 1) The Wyvern Theatre – an absolutely lovely theatre, with not a bad seat in the house and great acoustics. I’ve had many very enjoyable evenings here over the years. The theatre is named after the mythical wyvern which was once the emblem of the Kings of Wessex. The theatre was opened on 7 September 1971 by Her Majesty the Queen and His Royal Highness Prince Philip. A lovely, lovely theatre. 2) The Arts Centre – in Old Town, this 212 seater theatre has a modern studio for workshops and events, a cafe with a courtyard seating area and a lovely bit of public art in the shape of the ‘Applause’ sculpture. Here again, I’ve enjoyed many a fab evening’s entertainment. 3) Amateur dramatics: There are numerous dramatic and musical societies in Swindon: Swindon Light Opera Society (SALOS), the Swindon Gilbert & Sullivan Society, The Phoenix Players, Old Town Theatre Company (OTTC), Highworth Amateur Dramatic Society (HADS) The Western Players – another long standing organization according to their website: “The Western Players originated as “The Great Western Railway(Swindon) Mechanics Institute Amateur Theatrical Society” in the early 1900’s (the first production was of “Checkmate” by A Halliday on April 25th 1904) and celebrated its 100 year anniversary in 2004. It has performed over 240 plays at the last count (although research is still ongoing! )” And these are the just the ones I know about. 4) Swindon is the world capital of poetry – the poetry festival began in 2012. Now, in September 2013, the second one is coming soon. 6) Artiste and the Post Modern – as described on Swindon Web: ‘A group of artists have now turned The Old Post Office, Theatre Square, into The Post Modern Gallery and Studios … Drop in and make your mark, learn a new skill, or simply soak up the work from some of Swindon’s best artists. 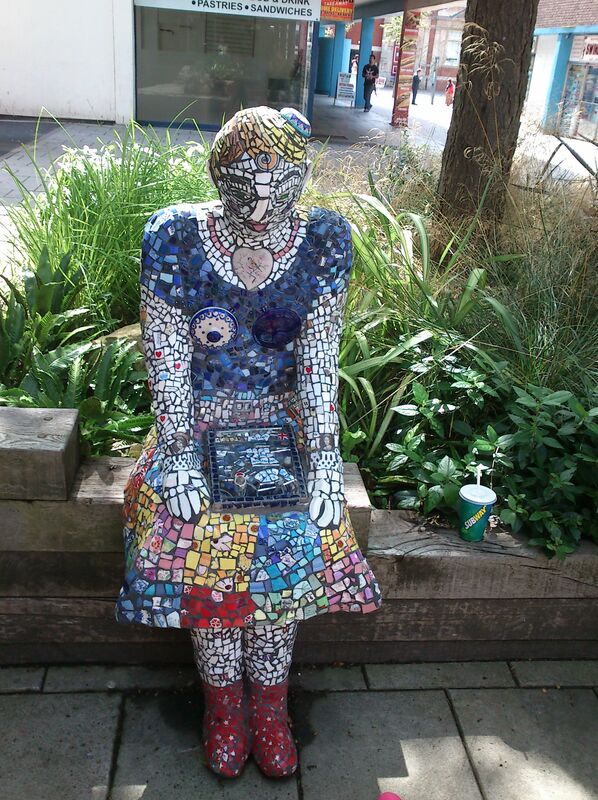 At the very least, you will see The Old Post Office transformed into a hub of creative excitement.’ There was a lovely mosaic lady outside the Post Modern but she is currently in for repair as she was vandalised. Seriously – why? I hope to see her again soon. 7) Public art all over the place – I’ve written at length, in various places on this blog, about the vast array of public art we have in Swindon. There’s the West Swindon Sculpture tour, then there’s the wheels on the old railway path, The Great Blondinis, the Lion in the town centre, the cow at the hospital and many, many more that I’ve not yet got round to blogging about. All in good time. 8) The live streamings at Wharf Green – I’ve seen a few of these now – opera from Covent Garden amongst other things – it’s just fantastic. Though it has to be said a bit more notice of these would be good. I got the e-mail about Tosca only a week before it was due to be streamed. So I had to miss that as I’d already got plans. I was fizzing! 10) Ken White – our very own mural man! Ken White’s murals and art works have been an integral part of the Swindon landscape for many years now. As I said in a previous blog post about him, if you think you don’t know his work you very probably do as he is the creator of Virgin airline’s famous red lady emblem. So that’s 10 areas of arts and theatre in Swindon. Then there’s also the Swindon Shuffle, Swindon Viewpoint, and of course the Mela – that amazing melting pot of Asian arts that has been a key part of Swindon’s cultural and artistic calendar for 11 years now. And not forgetting of course the Museum and Art Gallery in Old Town! This is just the stuff that I know about. There’s more – I’m sure there’s more. Swindon is that sort of town. And if there is please let me know – I’d love to hear about it. So no culture in Swindon? I don’t bloody think so! Swindon DOES arts – and you can find out more here. A quick rootle round Google will bring up all manner of information about this traffic system but our very own Swindon Web has a niece piece about it: ‘Until September 1972, there was only one Magic Roundabout and it was a children’s television programme featuring Dougal the dog, a hippy rabbit called Dylan and the spring-loaded Zebedee….’ That was certainly my knowledge and understanding of that term until I moved to Swindon. The roundabout is now rather famous/notorious – delete as applicable – it even gets a pictorial mention on The Huffington Post in a feature on quirky roads. It’s certainly celebrated here in Swindon – at the town’s tourist information centre all manner of Magic Roundabout souvenirs are available from T-Shirts to tea towels. The picture in this post is a lovely aerial shot of it on a postcard purchased there. It even inspired the song ‘English Roundabout’ by Swindon band XTC. See also: Swindon’s magic roundabout – Swindon viewpoint. and my post on an imagined guide book entry for the beast. I moved to Swindon about 20 years ago with my then 12 year-old daughter. We left a small village in Derbyshire, a part of the country left ravaged and war-torn (and that’s not too strong a term) by the miners’ strike and the Tory government. Not only were there no jobs and no prospects there was nothing to do and nowhere to go unless you had a car which I didn’t. Once Meadowhall and Cystal Peaks opened in the Sheffield areas, our local town of Worksop, simply died. So imagine then, how it felt to pitch up in a town that offered, within a ten-minute walk of my home: a cinema, and a swimming pool. Even more exotic than that though, a bowling alley, an ice -rink and a Pizza Hut! All in one place. Wow. You can’t begin to imagine the excitement. Add to that a decent shopping centre – a Debenhams, a C&A and an M&S and many more besides, a mere 15 minute bus ride away instead of the two buses and very lengthy trek to Sheffield for a similar shopping experience. Chesterfield and Mansfield were more accessible but it was Sheffield you needed for C&A and Cole Brothers and the like. So this was a metropolis indeed! Moreover there was the almost zero unemployment of that time. I simply could not believe the ease with which I found work! Not only a metropolis then, but, as far as I was concerned, the land of milk and honey. And all of this contributes enormously to the affection I feel for this town. Furthermore of course there’s the Oasis and Dorcan and Croft and Milton Road. And there’s all the parks and green spaces and a theatre and an arts centre. Of course since my arrival here there’s been the Greenbridge and Orbital developments and soon we’ll have the new set-up at Regent’s Circus. A veritable cornucopia indeed. So yeah, I know the town is not without its problems and faults but I’ll never forget how it felt to arrive here and find so many wonders right on my doorstep. I thought it was wonderful then and, even though the town centre is perhaps not what it once was, I still do. Well, yet another ‘at last’ this week. In this instance I finally managed to get beyond the threshold of Swindon’s Museum of Computing in Theatre Square. I’ve only been meaning to go in for about 5 years. Oh well, better later than never eh? Small it may be – but it’s perfectly formed. A real little gem tucked away in Theatre Square. I had a lovely little wander around wallowing in nostalgia as I went. Oh – the Commodore 64 – how I remember thee! My favourite game on that was Trivial Pursuit which was wonderfully animated. There was a character called TP and he stamped his foot with impatience if you took too long to answer the question. There were all manner of other animations on it too. It was well worth the pain that was sometimes involved in getting the cassette to load. Then there was the BBC Micro – oh how I coveted one of those. And all the different Macs. 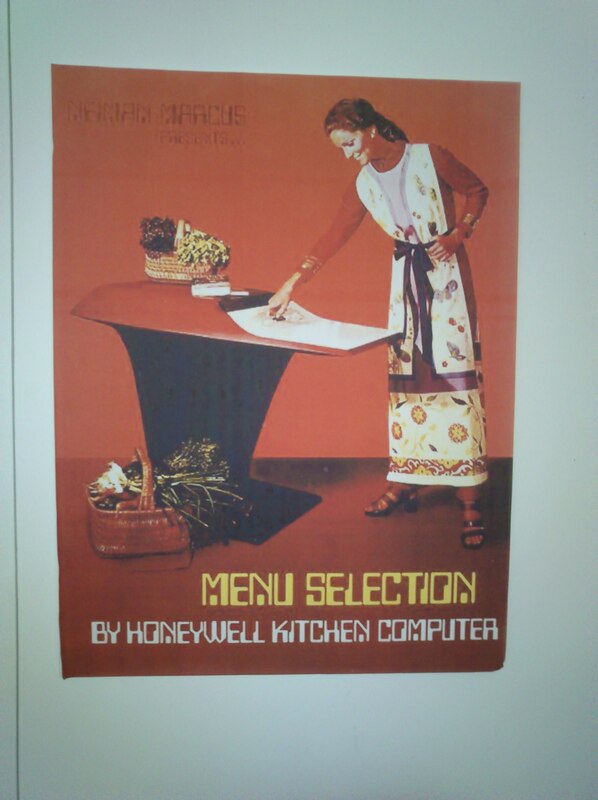 Or Macintoshes as they were then. Remember the translucent coloured ones? How achingly cool were they? Well they’ve got one of those. Amongst a whole host of splendid things. In 1946, when Hopper was released from active duty, she joined the Harvard Faculty at the Computation Laboratory where she continued her work on the Mark II and Mark III. Operators traced an error in the Mark II to a moth trapped in a relay, coining the term bug. This bug was carefully removed and taped to the log book. Stemming from the first bug, today we call errors or glitch’s [sic] in a program a bug.’ Which is really rather wonderful is it not? But hey – I reckon I prefer the explanation that the museum gives don’t you? It’s a much more interesting and poetic explanation! 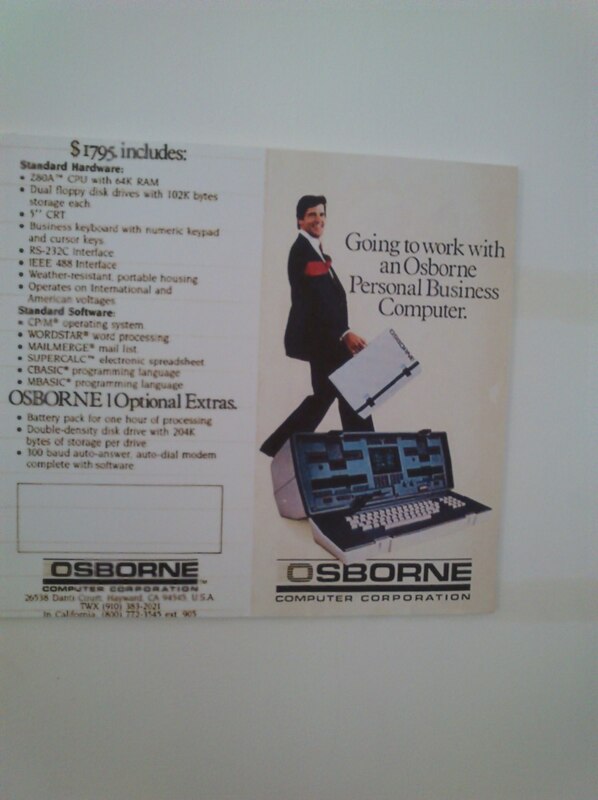 As I wandered round I saw a somewhat hysterical poster advertising a ‘Personal PC’ that was the size of a small suitcase. Hmmm. Well it all had to start somewhere eh? The museum puts on all sorts of special events, exhibitions and activities that lets the kids get really hands on so it’s a great place to keep them entertained and stimulated for a couple of hours or more at very little expense. Theatre Square is a great location with lots of cafes close by: the centrl library cafe, Cafe Ambience and of course the Wyvern Theatre so you are easily placed for refreshments before or after your visit. So don’t leave it as long as I did to have a look round. It’s the school holidays now so it’s the perfect opportunity to go in and say hello to Robosapiens, Furbees – my daughter had one of those till my sister murdered it – and the Sinclair C5 amongst tons of other stuff that the kids will just LOVE. ‘This year we celebrated our tenth anniversary. Volunteers, sponsors and friends got together to look back at a decade of exhibitions, events, and activities. From a small room on the Oakfield Campus we now have a town-centre gallery and have welcomed many people from around the world, as well as from Swindon. Find em on Facebook: https://www.facebook.com/MuseumOfComputing and see what they are upto. A nice blog post about Ken from Creative Wiltshire that has a good picture, courtesy of Swindon Libraries, of one of Ken’s sadly now long-gone murals. Ken, as they say, like Alfred Williams – the Hammerman poet, before him began his working life in the GWR works aged 15. He began work as a sign writer in the carriage and wagon works before being persuaded to enrol at Swindon Art school. And the rest, as they say, is history. 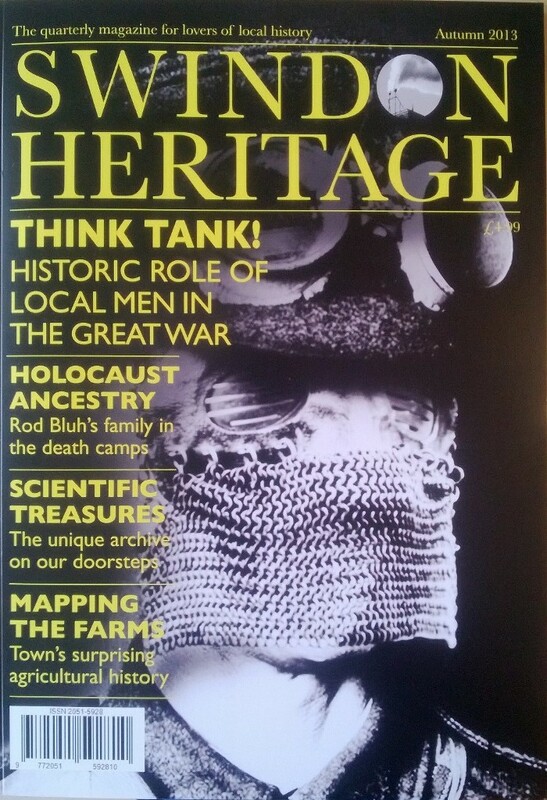 NB: The splendid Swindon Heritage magazine people also beat the drum for Ken White’s work and for Alfred Williams too. ‘Ken White is perhaps best known for his murals, sited in a wide variety of locations all over the world. To date, he has painted over one hundred murals. He was, for many years, the personal artist for Virgin boss Richard Branson and has completed works for him in many Virgin establishments throughout the world, including record shops, hotels and airport lounges. 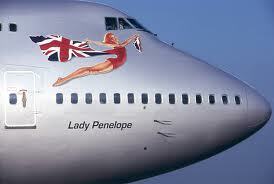 With the launch of Virgin Atlantic in 1984, Ken produced what is probably his most well known work: the “Scarlet Lady” emblem which features on all the airline’s aircraft’. So yep. Not only has Ken painted murals all over the world he is the creator of Richard Branson’s ‘Scarlet Lady’. See, I said you’d know his work. So is he not something to celebrate about Swindon? Well, as far as I’m concerned he’s worthy of his own place on my personal selection of ‘Ten things to celebrate about Swindon’ list – which is not being compiled in any particular order – rather than being clumped under the broad umbrella of ‘Arts/culture/heritage’ of which there is so very much here in Swindon. And how fantastic is that for a start? In Swindon though, he is best known for his murals, though tragically many of them are lost now due to development. 😦 which is such a shame – I really do love a good ‘muriel’ – as Hilda Ogden referred to hers. You can read more about Ken’s Swindon murals on SwindonWeb but better still go to Swindon Viewpoint where you will find numerous films of Ken. For those of you who have no idea what I’m talking about, the Gteat Blondinis were an acrobatic troupe who performed at circuses in Swindon in the 1920s. I’m sure though they were known beyond this area. I’m not from Swindon and I’m certain I’d heard of them before coming here. Or I could be thinking of Charles Blondin, the first tightrope walker to cross Niagra Falls? Hmmm. Anyway… The sculptor who created them was also responsible for Diana Dors at Shaw Ridge. The sculpture rather than the actress, clearly. I did know that the sculpture had been saved but I didn’t know where it now was. Thanks to a certain non-tax paying search engine I do now. A quick furtle on the internet found Duncan and Mandy’s website which reveals that the restored Blondinis now reside in St Mark’s park in the Ferndale/Gorse Hill area. 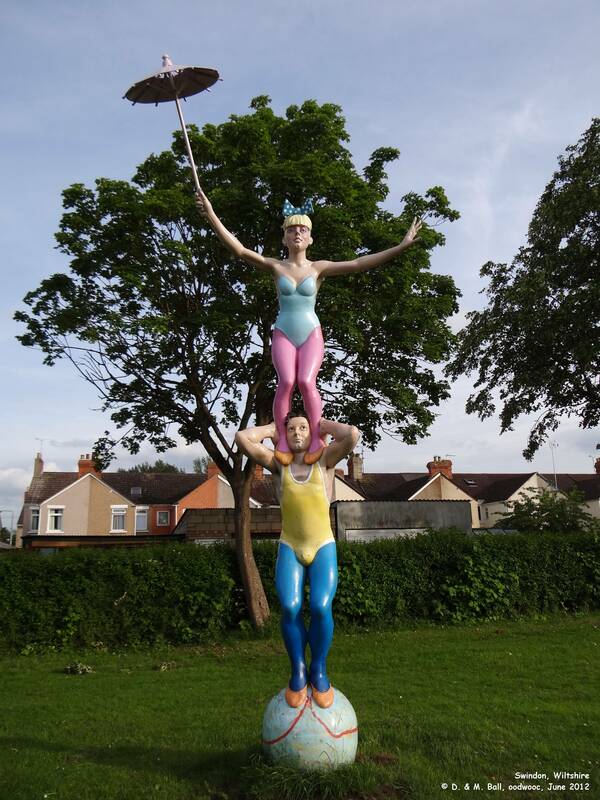 The colour photograph of the acrobats is courtesy of their website – a veritable mine of information about Swindon actually. So whilst it’s great to see them all cleaned up I’m still sad I don’t get to see them anymore. But I love a challenge! ...requires more than just good programming.